Prehistoric animal diorama creator Robert Townsend has sent into Everything Dinosaur another set of photographs of his prehistoric scenes. These pictures represent North American dinosaurs from the Early Cretaceous, a representation of the fauna that roamed the northern part of the United States and Canada up to around 100 million years ago or thereabouts, the Late Albian faunal stage of the Cretaceous. Three Iguanodon models encounter a Sauropelta. During the Early Cretaceous terrestrial faunas began to change. Over much of the world, the Sauropods began to be replaced by Ornithopods as the most dominant mega herbivores. New types of Pterosaur evolved and within the carnivores, new kinds of huge meat-eating dinosaur began to evolve, dinosaurs that have been assigned to the Carcharodontosauridae. Dinosaurs such as the Iguanodons and the Sauropelta in the photograph above, also had to be careful to watch out for “raptors” such as members of the Deinonychosauria clade, fearsome hunters like Deinonychus. Battles between polacanthids such as Gastonia (G. burgei) and raptors could well have taken place as the fossils of this five metre long, armoured dinosaur have been found in the same quarry as fossils of the ferocious Utahraptor (U. ostrommaysorum), a dromaeosaurid that might have weighed more than a tonne! Down by the river herbivorous dinosaurs had to run the risk of attack from crocodiles, distantly related to today’s modern crocodilians. A polacanthid (Gastonia) encounters a giant crocodile. The Gastonia model used in the diorama is one of the CollectA “Prehistoric Life” models, a diverse range of dinosaur and prehistoric animal replicas that does include a number of armoured dinosaurs including Polacanthus, Kentrosaurus, Minmi, Edmontonia, Wuerhosaurus and Miragaia as well as the more common models such as Stegosaurus and Ankylosaurus. 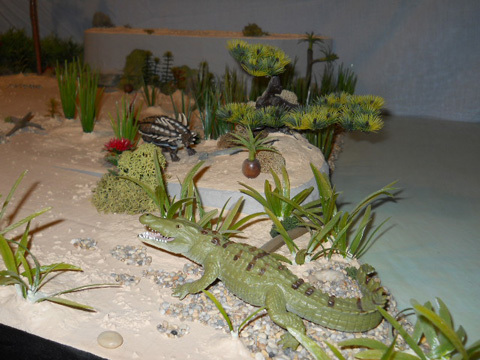 Diorama maker Robert admits that when he started making his prehistoric animal landscapes the range of dinosaur models available was quite limited and the Internet was very much in its infancy. These days Robert and fellow model makers have a much wider choice of prehistoric animal replicas to choose from. Some models, first made in the 1990’s have even made a comeback over the last two years or so. Take for example the Acrocanthosaurus model pictured below. This is a Battat Terra Acrocanthosaurus model that was first designed for the Boston Museum of Science. A repainted, new version of this dinosaur was introduced just two years ago. Once again Robert has taken care to try and depict animals that lived in North America during the early part of the Cretaceous period. The Acrocanthosaurus model can be seen in all its glory posed next to the plaque that accompanies Robert’s dinosaur diorama. An Acrocanthosaurus poses by the diorama plaque.